If your family is growing in numbers and you’re considering the move to a minivan, why not choose the minivan that started in all? The 2015 Dodge Grand Caravan minivan continues the legacy of the original minivan, introduced by Dodge as the Caravan in 1984, and the long-wheelbase Grand Caravan in 1987. Over the years, Dodge has continued to lead innovation in the minivan segment, with often-imitated features like the revolutionary Stow 'n Go® Seating and Storage System that you’ll find on 2015 Grand Caravan models. When you’re ready to test drive – and test out – the features of the 2015 Dodge Grand Caravan, bring the whole family down to Woody Folsom Dodge in Baxley, GA. Our friendly sales staff will get you behind the wheel – and your kids buckled into the spacious back seats! Who says a minivan isn’t allowed to pack a powerful punch? 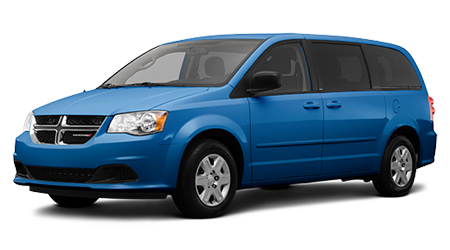 The 2015 Grand Caravan is powered by Dodge’s award-winning 3.6 liter Pentastar V6 engine, mated to a 6-speed AutoStick® automatic transmission. This family hauler’s Pentastar V6 churns out a surprising 283 horsepower and 260 lb-ft of torque – that’s plenty of power for any amount of cargo or kids you may need to transport. When you choose a spacious and powerful Grand Caravan, you won’t have to sacrificed fuel-efficiency. Dodge’s minivan achieves an EPA-estimated 17 city/25 highway mpg. When it’s time to trade up from you family’s current vehicle to a spacious minivan, visit Woody Folsom Dodge in Baxley, GA to view the 2015 Dodge Grand Caravan. We’ve been proudly serving the Pine Grove, Graham, Dublin, Savannah, Jacksonville, and Brunswick, GA area for years, and we look forward to finding the perfect vehicle for your family too! When your family is comfortably cruising around Georgia in a 2015 Dodge Grand Caravan, you’ll be glad you made the decision to stop into Woody Folsom Dodge.